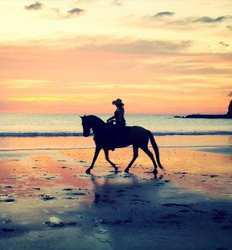 Whether a romantic sunset horseback ride or a full day of adventure including horseback riding and hot springs sounds like the perfect vacation activity to you, we have you covered with your choice of Tamarindo Horseback Riding tours. There are few tours more ec0-friendly than horseback riding tours. Seeing as Costa Rica is one of the world leaders in ecological tourism, you can imagine that we have a great selection of horseback riding tours to help you explore their county without leaving anything more than a carbon footprint. Let our horses leave the hoof prints while you sit back in the saddle of one of our Tamarindo horseback riding tours and explore the beauty of Guanacaste. Best of all, the Guanacaste region surrounding Tamarindo is home to some of the most amazingly well preserved haciendas. These ranches shaped the culture of this region, are still owned and operated by local Tico families with their well-groomed well-trained horses. These ranches are the pride of Guanacaste. 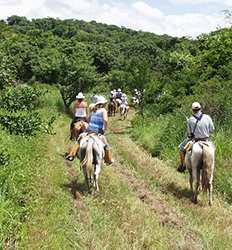 The Real Deal Tours offers you the best selection of horseback riding tours in Tamarindo and the best deals in Costa Rica. So if you are up for a galloping in the pasture, sauntering through the forest, and climbing to breathtaking views of the mountains, we have the perfect Tamarindo horseback riding tour just for you. One of the must do activities in Costa Rica is a visit to Hacienda Norma, a 150 year old working horse & cattle ranch on over 1400 acres of primary & secondary forest in Guanacaste. Whether it´s your very first time on a horse or you´re an old pro at this, you´re sure to have fun on our Pura Aventura Horseback Riding tour! Pura Aventura Horseback Ride deposit is $10.00 per person for 1 Activity, $20.00 per person for 2 Activities and $30.00 per person for 3 Activities. A romantic sunset horseback riding tour in Costa Rica is the perfect start to a romantic evening with your loved one, or the perfect wind-down from a busy day with friends! The best part is of course the sunset and our destination is the highest lookout point of our 1400 acres of forests, hills and rivers at Hacienda Norma. Pura Aventura Sunset Horseback Ride deposit is $11.00 per person. This tour departs at 4:00 PM. 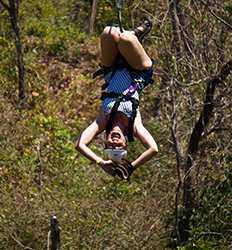 This tour is a full day tour that includes the Canopy Tour, hot springs, a Natural Spa, a thrilling Waterslide & a Horseback Riding excursion. 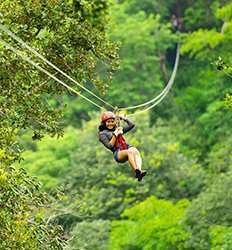 This truly offers something for everyone and is sure to please the adrenaline junkies as well as the tree hugging nature lovers. Enjoy this jungle spa adventure as you relax in the rainforest! Saddle up and sit back to enjoy views of the Rincon de la Vieja National Park on this horseback riding tour in Costa Rica. Our well-trained horses will allow you to enjoy the sights of the Rincon de la Vieja, Santa Maria, and the dormant Cerro Von Seebach volcanoes. Costa Rica´s famous expression, "pura vida" has never been more applicable! 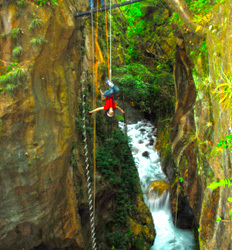 Canyon Lodge Adventure Combo deposit is $30.00 per Adult and $25.00 per Child. So many wonderful things to do in Costa Rica and so little time? Not to worry! Our Vandara Hot Springs Adventure tour is a full day excursion in Costa Rica where you can choose the activities you want along the way! 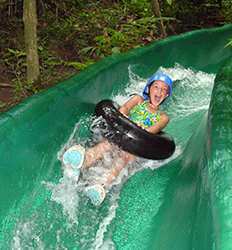 Also at the Vandara Adventure Park, , keep your heart rate pumping with our huge water slide! 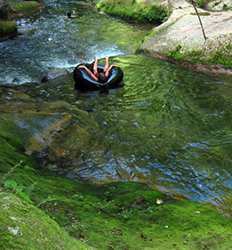 Vandara Hot Springs Adventure Park deposit is $30.00 per Adult and $25.00 per Child. Ready for a day in Costa Rica that will exceed all of your wildest expectations? Just off the Panamerican Highway outside of Liberia, the Rio Perdido Adventure Resort is a true gem in the heart of Guanacaste. Our Rio Perdido Adventure Resort is the ultimate Costa Rica excursion with the perfect combination of adventure and relaxation. 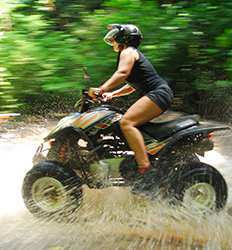 Rio Perdido Adventure Resort deposit is $35.00 per Adult and $30.00 per Child. Enjoy an action-packed and fun-filled day on our Borinquen Mountain Adventure! Whether you´re a solo traveler, couple, or a family, you´ll make memories to last a lifetime on this special day. Experience a scenic horseback ride, zippy canopy tour, and even a relaxing soak in volcanic hot springs! Canopy, horseback riding & hot springs...this is the complete package! Borinquen Mountain Adventure deposit is $30.00 per Adult and $20.00 per Child.